Sly Fox Productions in association with Ferncroft Media, are in production with their brand new drama series QUEENS OF MYSTERY, commissioned by Acorn TV with Acorn Media Enterprises. A contemporary, warm-hearted spin on the classic murder mystery, QUEENS OF MYSTERY will feature a stellar line-up of great British acting talent including Julie Graham, Siobhan Redmond, Sarah Woodward and Olivia Vinall as the eponymous Queens, alongside a sterling supporting cast and guest stars including Martin Trenaman and Omid Djalili. 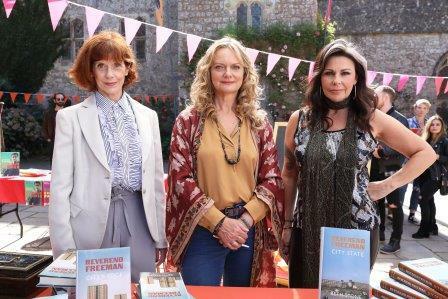 Created for television by writer Julian Unthank (Doc Martin, New Tricks), the show has been commissioned by Acorn Media Enterprises (AME), the UK-based development division for the Acorn brand of RLJ Entertainment, Inc. (NASDAQ: RLJE). It will comprise of three feature length episodes and is currently filming in carefully chosen locations across the UK. A British television deal is under discussion. QUEENS OF MYSTERY follows the entertaining adventures of Beth, Cat and Jane Stone, three crime-writing sisters, and their 28-year old niece, Detective Sergeant Matilda Stone. Using their extensive knowledge of crime – both real and fictional – they solve whodunit style murders in the picturesque English region of Wildemarsh. But no matter how many cases they are able to crack, the unsolved mystery that haunts them all is that of Matilda’s mother’s disappearance. Between investigating murders from the curious to the bizarre and writing their own renowned novels, the three aunts also attempt to help their perennially single niece find love. Star of stage and television Olivia Vinall (The Woman in White, Apple Tree Yard, Maigret) will play the ambitious Detective Sergeant Matilda Stone. Her aunts are set to be played by respected actors Julie Graham (The Bletchley Circle, Shetland) as the rebellious Aunt Cat; Sarah Woodward (The Politician’s Husband, New Blood) as the motherly Aunt Beth; and Siobhan Redmond (Alfresco, Between the Lines) as the book smart Aunt Jane. They will be joined by Andrew Leung (Doctor Who) as the dashing Dr. Daniel Lynch; Rebecca Grant (Doctors, Holby City) as Daniel’s strident girlfriendNatasha; Michael Elcock as Police Constable Terry Foster, who has had a long term crush on Matilda; and Martin Trenaman (The Inbetweeners) as the dry Inspector Derek Throne. High profile guest stars include Selina Cadell (Doc Martin), Omid Djalili (Dickensian, The Mummy), and Chu Omambala (Liar). James Hilton - Write what you know or don’t.